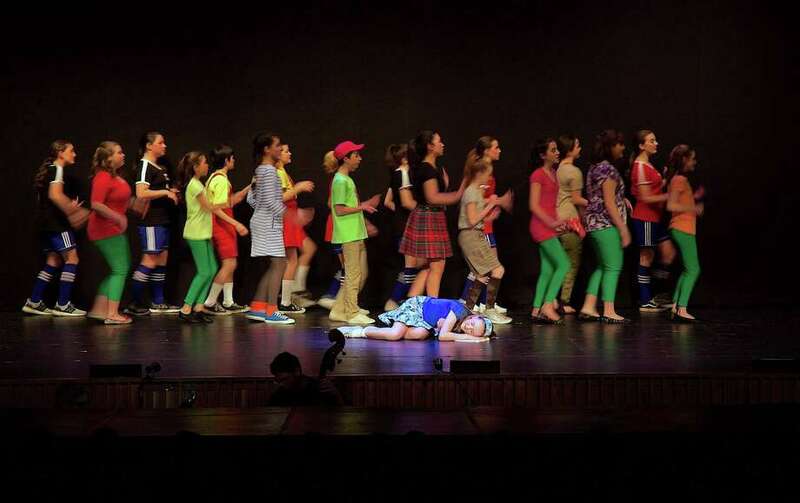 Kennedy Boehme, 13, of Weston, as Alice, sleeps while her dreams begin on stage at the Weston Middle School Short Wharf production of "Alice in Wonderland, Jr.," at Weston High School, Friday, Jan. 25, 2019, in Weston, Conn.
WESTON — A bevy of talented Weston Middle School students took viewers down the rabbit hole this weekend when they put on a production of “Alice in Wonderland Jr.” at the high school auditorium. “It’s a junior version, so it’s kind of been simplified,” said director Tina Parziale, who led a cast of 45 students and 10 technicians, along with volunteers who helped out from the high school. “Something that I find remarkable about this group is how kind they are to each other,” she said, unlike some productions she has been involved with elsewhere in where there’s competition and catfights.